So, you’re taking a shower, and you notice the spray is weak. When you look down, you see that not all of the water from your pipes is making it to your shower head. In fact, a good amount of it is leaking out of your bathtub spout. And that water is just going down the drain instead of hitting your body. Even if your tub spout just drips or dribbles a little, you probably don’t want to waste this water. It’s not like you’re shower is leaking outside the tub – it’s just more of an annoyance. For this article, we’ll assume your bath and shower has a tub spout and a shower head, and that you pull up or push down on a little knob on your bath’s tap to route water either to just the tub or up the shower head. This little knob is what’s attached to the shower diverter and no matter how hard you pull up, you just can’t stop the tub spout from leaking! Don’t worry. There’s hope for this as a simple DIY fix. Read on and learn just what’s going on and how you can take charge and get a full stream of water for your showers again. What Is a Shower Diverter in a Bathtub Anyway? Well, we know what a shower diverter does in keeping water from going into your tub when you’re taking a shower. You’ll this setup when your bath has a combination shower/tub faucet. The shower diverter does it’s job simply by raising and lowering a small gate (called a diverter gate) to either block or allow water from coming through. It stops doing a good job of this when it gets worn, corroded, stuck or blocked. When parts wear out or are so compromised by hard water build-up there isn’t much you can do to fix or even replace the small parts inside. 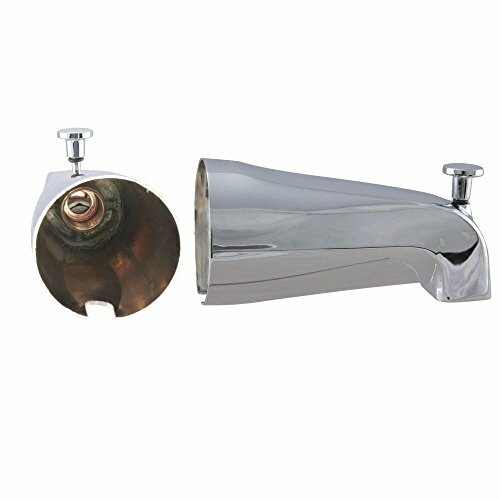 Your only hope is to get a replacement spout such as one like these, which of course comes with a whole new diverter and lever. With a faulty or broken shower diverter valve, your only choice really is to replace it instead of actually fix something within this mechanism. What’s more, is that you can’t just replace the diverter valve itself; you’ll need to buy and replace the bathtub spout altogether. Rest easy, because these usually aren’t that expensive. Like any bathroom component, the more designer something is the higher the price. The good news is that you can simply remove your old one so you’ll know which kind to replace it with. Before going forward, you can always take a quick look inside the end of your spout at the diverter valve components with a flashlight and see if there are any obstructions in there that can easily be removed. If you do see something in there, remove it and test out the diverter and your shower. Chances are though that it’s ready to be replaced, especially if it’s stuck in position. Look under your spout and see if there is a little hole or opening near where the back of the spout meets the wall. If there is, then you would use an allen wrench (hex key) to unscrew the little screw inside there. This will allow you to pull the spout directly out from the wall. Be sure to cover the drain so you don’t lose the screw! No hole with a screw? If you don’t have a hole and screw at the “‘under belly” of the spout, then you will need to twist off the spout with your hands. Do this by grabbing hold and twisting counter-clockwise. If the spout doesn’t budge, then insert a stick of solid wood or the end of a hammer and turn the spout with this added leverage. Don’t worry about bending it as you’ll soon be replacing it. If your shower and bath diverter spout was sealed with caulk, you can cut through this with a utility knife to make removing easier. When the spout is off, just make sure to match the same type when getting the new one. For example, if you had to twist yours off, then check that the threaded inlet hole on the new shower diverter spout is in the same position and is the same size diameter as your old one. When you twist your new tub and shower diverter spout on, do so gently. These can be damaged if over-tightened. Don’t forget to re-apply sealant made for bathrooms around your new shower diverter spout when you install it. Here are some simple directions to fix the shower diverter in the spare bathroom. If its leaking when the diverter is up, why would you have to replace the entire spout, can’t you just get a new washer? The one that sits in the plastic piece that is attached to the rod and knob that you pull up on? That’s my problem, my spout is fine, that washer is completely shot, how can I get JUST a washer? Generally, diverter parts such as the washer just aren’t sold separately. This is one of those components where manufacturers find it easier just to sell the entire assembly (spout, diverter mechanism and lever) than individual pieces. Unfortunately, this is how it’s always been with tub spouts. The good news is these are pretty inexpensive ($5 or less) from universal types to brand-specific (unless you have some designer type or special kit setup). The bad news is the minor inconvenience described above to remove and replace the spout. It’s not so bad though. 4. Dispose of excess parts. 6. It is revolting to spend $8 to get a 5 cent washer but you do what you have to. Someone makes these things. In my situation I am starting to think that I will have to repair the spout. Mine is a Waltec with an external shower. I am having a terrible time finding any brand that has that feature but is not a screw on connection to the plumbing in the wall. If anyone has instructions on opening up one of these spouts so I can get a look at the o-rings or washers inside please let me know. A manufacturer of a total replacement spout would be great too.